I would like to share with you today a detailed GoPro comparison chart of the three Hero4 cameras (GoPro Hero 4 Silver vs Black vs Session) and the two Hero 5 cameras (GoPro Hero 5 Black vs Session). This in-depth review/comparison aims to help you choose the most suitable camera taking into consideration video, audio, features and price. I personally own most of the GoPro models, I have tested them in different activities from taking family photos to kitesurfing, hiking and many other adventures. I will try my best to give you a clear explanation so it will be easier for you to understand the differences in case you are planning to upgrade from an earlier GoPro model or to get a new one. I will be talking about the three Hero4 models today, Hero4 Silver, Hero4 Black and Hero4 Session, along with two Hero 5 models – Hero5 Black and Hero5 Session. What I like about GoPro is that each camera has its unique features when it comes to the video resolution or the LCD display. Enough Talking, Let’s Compare GoPro Cameras! I will divide the post in 6 categories, and under each category I will be talking about the differences between the models. Categories will make it easier for you to see the difference. If you already own an earlier version, you will notice that there are many improvements with both Hero4 and Hero5 series, like high resolutions and new features. What remains the same is the battery life which didn’t improve in any of the new models, initially the battery will last up to 2 hours. You’ll need extra batteries if you are willing to shoot videos for a longer period. 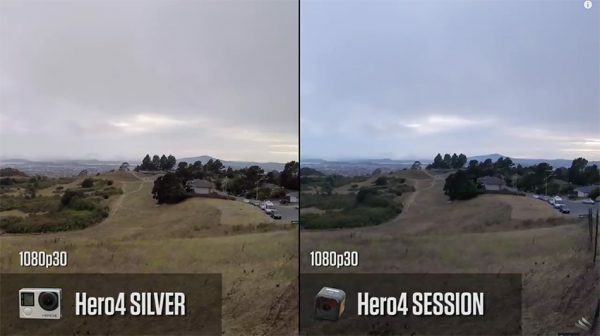 You will notice a big difference between the Hero4 session compared to the silver and black editions. Let’s scroll down to see the GoPro cameras comparison. All three cameras produce the same video format (MP4, H.264), they can shoot full HD videos(1080p) with high frame rates, the silver and black can shoot videos up to 4K and 2.7K unlike the Session who can shoot only up to 1440p. The black however can handle 4K at 30 frames per second whereas the silver at 15fps which is not that great and that is due to the higher bitrate, 60Mb/s for the Black and 45Mb/s for the Silver. Do keep in mind that you need high performance memory cards to handle this high bitrate, you cannot just use any memory card you have, I would recommend you get the SANDisk Extreme Pro 64 GB which has the highest speed (95Mb/s), so if you are willing to take 4K or 2.7K videos then the Extreme Pro is the one you need. As you can see, there is a noticeable difference between the two when looking at the colors, the Session made the video more “Blue” and less “Green” compared to the more realistic colors captured by the Silver. Coming to the Hero 5 series, the Hero 5 Black emerges as the superior camera by only a slight margin. 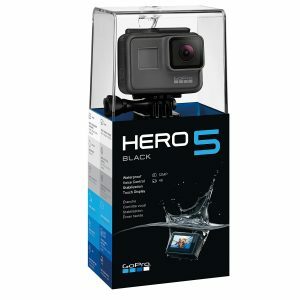 Considering the fact that it combines the best features of all previous GoPro cameras into a single product, the Hero 5 Black is definitely the best of the lot when it comes to video specifications. In comparison to the Hero 5 Session which has a lower resolution, 10 megapixel camera sensor, the Hero 5 Black boasts of an impressive 12 megapixel sensor. It shoots at a higher maximum frame rates than the Hero 5 Session, and, therefore, offers a smoother video. 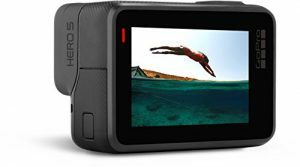 At 4K resolution, both cameras have a 30 fps limit, but as you scale down the resolution, the maximum frame rates increase in case of Hero 5 Black. It can shoot 1440p at 80fps and 1080p at 120 fps, whereas the Session can only manage 1440p at 60 fps and 1080p at 90 fps. What’s more is that the Hero 5 Black offers a lot more options like white balance choices, faster shutter speed, higher maximum ISO settings than its Session counterpart. You can even record an audio track separately with the Hero 5 Black. Another important feature of the Hero 5 models that must be mentioned here is the electronic image stabilization, or simply, EIS. This is a feature that comes into useful when you are recording a video at a place where you are prone to a lot of camera jerkiness. 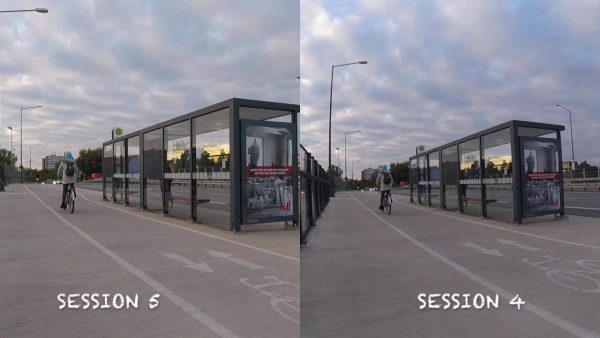 What the EIS does is that it crops into the image and compensates for the camera movement, thereby rendering a smooth, somewhat floaty at times, video. This is a new in-camera feature that was not available in the Hero 4 variants, and one that is bound to become popular with time. Let me tell you that all three have good audio, the audio format on the Black and Silver is 48Khz AAC. 32KHz AAC for the Session. You wouldn’t notice any difference in the recorded sound, of course you need to make sure that the black and silver are not enclosed in the waterproof housing which kills the sound. The session doesn’t have an audio input compared to the other two, where you can use a mini USB to 3.5mm jack adapter to connect an external mic for better sound quality, which can be useful if you’re using your GoPro for live streaming or a webcam. The microphones on the Hero 4 models, however, stand no chance in front of the Hero 5 series. Courtesy the waterproof design of the Hero 5 Black, its microphones have a far better audio capture ability, which when coupled with the wind reduction feature, makes the product a significant upgrade from Hero 4 Black. As mentioned earlier, the Hero 5 Black even allows you to record a separate audio track and play it along with the video – a feature that is not available even in the Hero 5 Session model. It is justifiable, therefore, why the Hero 5 is regarded as arguably the best GoPro camera to be launched in recent years. Having the same 12Megapixels sensor on both Hero 4 Silver and Black, no noticeable difference when it comes to still shots at 4000×3000 pixels, you can also set still shots to other modes like 7Mp and 5Mp. The Hero 4 session has an 8 Megapixels sensor and can take photos at 3264×2448 pixels. You might want to keep a steady hand when taking still shots with a GoPro because of its slow shutter, so you might not get a smooth photo if you’re moving. You may need to stabilize the camera by using a tripod if you are taking still images in order to have the best quality possible. The Hero 5 Black also provides 12 MP photos, while the Hero 5 Session offers 10 MP only. The images are sharp, free of noise, and having clear details. The colors are vibrant as well. Interestingly, the Hero 5 Black stands out in its ability to save pictures in RAW file format, thanks to the GPR file extension. The RAW support gives you more control over the editing and post-production processing of images. This is actually great for photographers who are serious about their passion and are willing to put in that extra bit of effort in order to personalize their images. This camera also has a Wide Dynamic Range (WDR) mode which is essentially similar to HDR, and is designed to emphasize shadow details and highlights. These are, however, exclusive to the Black variant since the Hero 5 Session, unfortunately, supports neither RAW mode nor WDR mode. Both Hero 5 models allow you to save your pictures as JPG files though. All three Hero 4 cameras have Bluetooth and WiFi which enables you to connect to your smartphone using the GoPro App so you can control your GoPro, change settings/modes and playback your videos and photos. It basically acts as a remote control which is pretty cool. 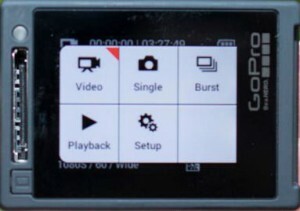 You can also connect it to the GoPro Smart Remote that also lets you control and capture footage remotely without the pain of using the buttons on the camera. Protune for videos and stills is available only for the Black and Silver editions, the Session has only Protune for still shots. The three GoPros can take time lapses in photo mode. Time lapse in video mode and night time lapse are only available in the Hero4 Silver and Hero4 Black. So if you’re like me and love to shoot night time lapses of the milky way then the silver and the black are your best option. Burst mode is also available in all three, 30 photos per second in the Black and Silver and 10 photos per second in the Session. Coming to the Hero 5 cameras, GoPro has changed the name for its companion app to Capture. Just like the Hero 4 models, these cameras also permit you to pair your device or connect to the Wi-Fi in order to transfer your images and video files to your smartphone or tablet. Interestingly, you can grab still images from video captures via the app, resulting in high quality images, thanks to the recording in 4K resolution. 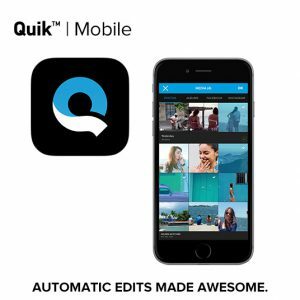 There are two more apps – Quik and Splice – that make editing and sharing your files easier. 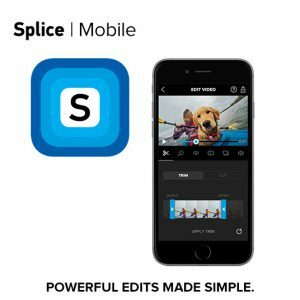 Splice is only available for iOS though. The Hero 5 Black allows you to overlay telemetric metadata onto your videos via GPS in addition to the basic geotagging feature. In comparison, the Session variant does not possess GPS functionality. The new voice activation system is another major upgrade. It lets you begin and stop recording, take photos, and change modes when you are away from your camera or your hands are occupied. The Hero 5 Black, in fact, can understand commands in seven different languages. Both Hero 5 models offer Protune for videos as well as photos, but the Black variant, understandably, offers more options. For instance, the Hero 5 Black lets to set a minimum ISO in addition to the maximum ISO, which is not the case for Hero 5 Session. Both have night mode, and both can take bursts up to 30 photos per second. So yeah, we are used to having cameras with displays on the back but it’s not the case with GoPro. The Silver being the first ever model that comes with an integrated LCD which is honestly beneficial. You can change settings/modes and playback directly from your camera. But the LCD needs power which means that using it all the time will drain your battery at a faster rate. What you can do is turn it off when you’re not using it to save battery. 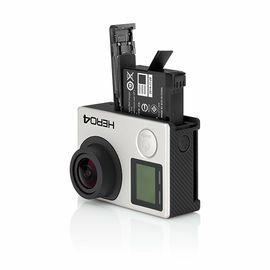 If you want to buy the Hero4 Black but still want an LCD then you can get the optional GoPro LCD BacPac that attaches on the back of your camera. This additional LCD makes the GoPro bulkier so you need to use the backdoor housing that comes with the LCD because it won’t fit in the standard one. You might also need to turn off the display when not in need to save battery life. The only way to remote control your Hero4 Session is by using your smartphone and the GoPro app as I mentioned earlier. The Hero 5 Black also comes with an LCD display, but it’s a significant improvement over that of the Hero 4 Silver. It bright and clear, and has a more intuitive touchscreen interface. You can now swipe in from the edges just like you would do on your smartphone. You can even lock the screen before going down to the pool so that there are no unintentional clicks. Having said that, the touchscreen may seem to be a bit on the slower side for the average user. It is not as responsive as smartphones, and that may cause a few problems during navigation. Also, the screen becomes vulnerable without a protective housing; so you have to careful about that too. These are not deal-breakers though, and the benefits far outweigh the drawbacks this product possesses. The Hero 5 Session, on the other hand, does not have an LCD display. I’m sure you have now realized that the battery on the GoPro is not that great. You can always get extra batteries for the Black and Silver in case you are planning to shoot videos for longer than 2 hours. Unfortunately, the Hero4 Session have a builtin battery so once its drained you’ll need to plug the camera. It can be a downside for some people but hey the Session is a great camera compared to its features, size and price! Coming to the Hero 5 models, the Black version uses a battery that is physically different from that used by the Hero 4 Black. You would expect some improvement in performance with that, but the fact remains that both run out of juice in approximately the same time. So it’s probably wise to carry an extra battery if you are planning to record for a long period of time with your GoPro camera. Unlike its Black counterpart, the Hero 5 Session runs on a non-removable battery, so carrying an extra one won’t make much of a difference in this case. Both cameras feature USB Type C ports for recharging. This is yet another improvement from the previous models. None, however, come with AC adapters. There are small cover doors over the ports that make the cameras waterproof. The Silver and Black editions use the same waterproof housing since they are the same size, on the other hand, the session doesn’t have a housing but the camera itself is waterproof. 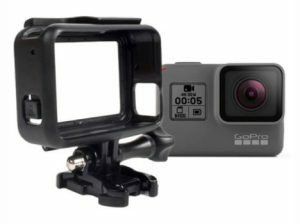 Basically, GoPro accessories are compatible with all three cameras except of course some that were made for specific models, like the LCD BacPac and the GoPro Battery BacPac as I mentioned earlier in the article. All other accessories are the same since all GoPros have the same base. Keep in mind that you need to buy a MicroSD card because it’s not included with the camera. Similar to the Hero 4 Session, both the Hero 5 products have waterproofing incorporated into the body of the camera. No longer do you need to carry around a waterproofing case with you, thus making the camera smaller and lighter. Moreover, the lack of a covering case helps in getting a better sound capture too. The Hero 5 Black is waterproof up to a depth of 10 meters; so you will need a case if you are planning to dive deeper. Further, the trap doors covering the ports may get loose and allow seepage of water, ultimately destroying the product. The physical difference between a Hero 4 Black and a Hero 5 Black is the mild increase in size in the latter. The edges are more rounded, and the rubbery coating feels better. This difference, however, comes with its own disadvantages. You can no longer use your Hero 4 mount with the Hero 5 Black; nor can you use the batteries from your Hero 4 models. None of the Hero 5 cameras have mounting points on their own. The wrap-around frame that comes with them can serve the purpose of mounting, but does nothing to protect the device. 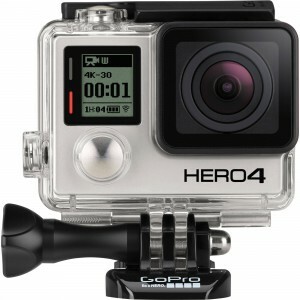 Gimbals are also available for GoPro, you will find a lot of models in the market. I have compiled a list of 12 best GoPro gimbals for 2017, it’s worth to have a quick look at the list before making a purchase. So as you saw in my above detailed review, all three Hero 4 cameras are great. Of course the Black and Silver have more features and flexibility but that doesn’t make the Session a bad camera, on the contrary its size and features makes it as awesome as the other two, it really gives you value for every dollar spent on this camera. I personally pick the Black, but hey it’s my personal decision. If you want to have an LCD then go with the Silver. If you need to take ultra HD 4K videos then go for the Black and if you need a small camera that can shoot 1440p and don’t care about the LCD then go for the Hero4 Session. The Hero 5 Black is, undoubtedly, the best among all of these. It is a solid piece of technology that incorporates the best features from the Hero 4 models, and improves on several fields. Further, it gives you a lot more authority on how your pictures should turn out. The Session variant lags in some departments, but still offers value for money if you are on a budget. Very well explained comparison. I really like how informative this comparison is. For me I prefer the gor pro hero black than the other 2. It has more features than the other 2 and has better specifications. But even though it is the best camera among the three go pros it is the most expensive one. 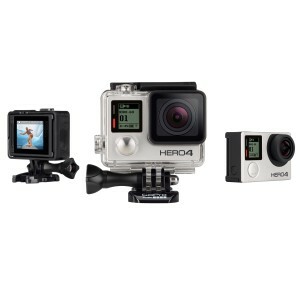 If I could have the money I will choose the black but if I’m on a budget I’ll pick the go pro session. Thank you to this review. If I am working on a farm and want to record it, like mount it on a tractor, or on a jeep for trail riding which one would you prefer for that kind of stuff. 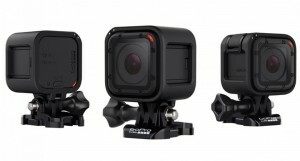 The Hero 4 series looks like it has three very good options. The silver looks like the one for me. I like the 4K of the black, I do have one TV that I can display this on, it would be very impressive for someone to watch on a 65 inch. I am not sure it is worth the extra $100. I do like to do nature picks and videos, I like the time lapse video feature for spider webs and some flower blooms. Hi John, indeed the 3 cameras are impressive. The 4K resolution is not for everyone, not many people use it since they don’t have the proper equipment to playback this resolution. I wonder how nice it would be to watch 4K on a 65 inch TV! Lucky you!I think the silver is your best option. It has all the black’s features except the 4k but comes with an integrated LCD! The Session is way cheaper than the other two but at considerable lesser features. I think I will still choose between a Black or a Silver. I am still torn between them. They are basically the same GoPro. Is it really worth a $100 difference? Do I really need a higher resolution? You said that the images they provided are the same quality. Well, the Black has a faster processor than the Silver which gives it the ability to shoot 4K videos at 30 fps. I don’t think you need the 4K unless you’re shooting something really extra ordinary. 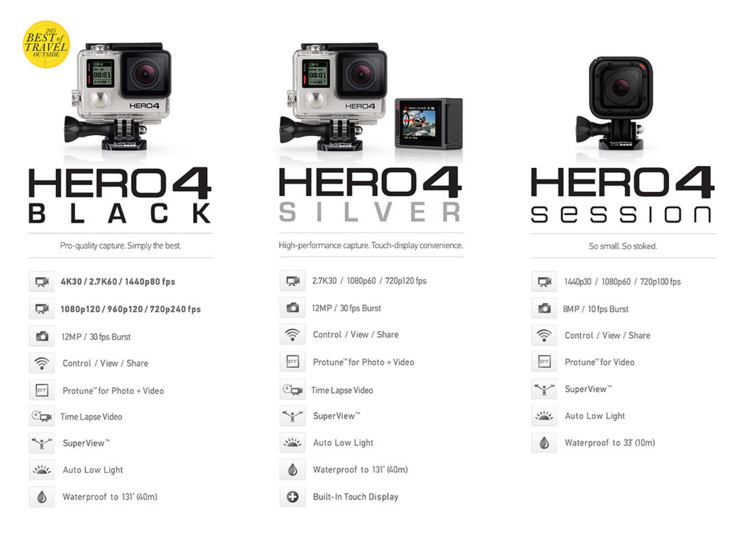 I would stick with the GoPro Hero4 Silver, you’ll get an integrated display at 100$ cheaper than the Black. Hi Michel, I’m looking for a GoPro that would be easy to run around/jump around in. I’m in the entertainment business, and do a lot of ‘crowd work’ and ‘line work’ which requires me to make sudden moves at times, and Im in need of something that can take decent footage of the crowd while being secure in running/jumping and also the occasional bumping into people. I would like it to be something easily operatable even while wearing heavy costume or makeup/masks so something simple to turn on and off (without having to sit down to operate) is my ideal gopro camera. I’m very new to GoPros so if you have any suggestions it would be much appreciated! Thankyou!! Hey there! in you case any GoPro can do the job, they are made for action sports, you can mount it anywhere, on you chest head, back, fix it on a tripod and tens of different mounts. Check this article to see what accessories you can get. Thanks. I have been thinking of getting a GoPro for when I am camping in the mountains. So often we catch wildlife or just some great views that would be nice to not only share with others, but to remember ourselves. Which one do you think would work best for a mix of hiking and riding on 4-wheelers? Thanks! 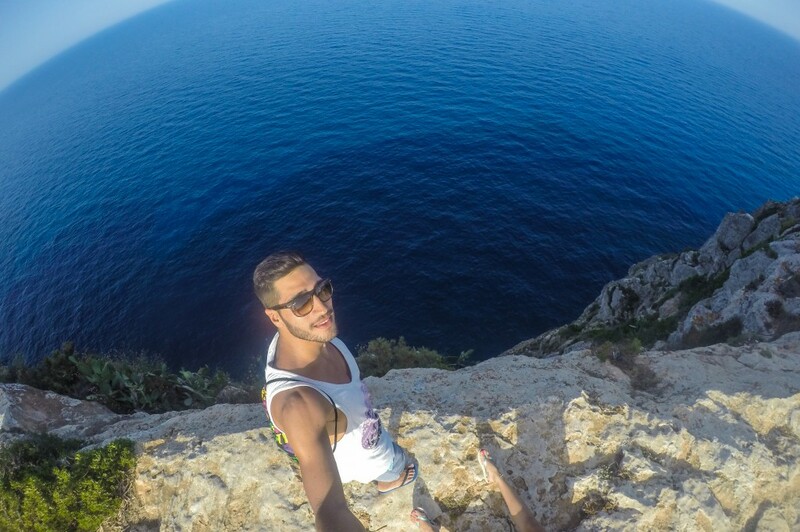 Hi James, if i were you I would get the Hero4 Silver, you can use it anywhere plus you get the integrated display which is great, I use it when hiking as well. Make sure to get the chest harness for hiking and the handlebar mount when you’re on a 4-wheeler!